It is a gift when an author transports you to the place he loves most. 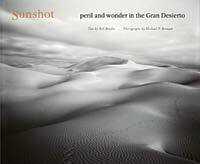 Writer Bill Broyles and photographer Michael Berman accomplish this in Sunshot: Peril and Wonder in the Gran Desierto, an exquisite portrait of place. Arizona’s Cabeza Prieta and Mexico’s Sierra Pinacate and Gran Desierto de Altar lie at the heart of the Sonoran Desert. This gritty vastness is the backdrop to daily news of human smuggling and immigrants dying in the borderlands. Broyles, a researcher with the University of Arizona’s Southwest Center, illuminates the region’s natural history with his sharply focused essays, superbly complemented by Berman’s black-and-white photographs. Broyles has often explored the Devil’s Highway, 130 miles of spiny, baking wasteland from Yuma, Ariz., eastward to Sonoyta in Sonora, Mexico. From his informal research on rattlesnakes to a hike retracing the historical route of salt gatherers, he uncovers the desert’s essence. Berman’s photographs reveal the contradictions of this place in stark, perfect detail. In one, ocotillos spring from a patch of basalt, rioting in numbers that defy the barrenness of the ground. Broyles’ empathy coexists comfortably with his desert-rat toughness. After an experiment with heat’s effects on his body in a parked car, he wonders, "What if I had been an infant, invalid, or pet, and couldn’t have opened the car door? What if I had been out there … on El Camino del Diablo?" Broyles’s compassion shines as he reflects on the border’s varied inhabitants: village residents, the Border Patrol, author Charles Bowden, a piñata maker. Ultimately, Sunshot speaks for a desolate place that needs our attention, as immigration rises and resource conflicts continue. We are compelled to acknowledge the Gran Desierto, thorns and all. "People don’t come to love the desert by rationalizing," Broyles writes. "They live here for a time and then accept its song or reject its noise."